For almost one week you could vote for the Most Promising RPG of 2012 and we now present you the results of your votes and the votes of the RPGWatch editors. Risen marked Piranha Bytes' successful comeback after the flawed Gothic 3. At its core Risen is the transfer of the proven formula from the early Gothics to a new franchise, plus the addition of an intuitive interface. Fans found exactly what they were looking for: an open world RPG with a lot of depth and the trademark rough atmosphere. While PB did indeed deliver a good, entertaining and technically rock solid game, there was also criticism: innovation wasn't part of the concept, we've seen it all before back in the early 2000s, the console conversion was phoned in, and PB generally aimed quite low. All of this is about to change in Risen 2 - Dark Waters. The world will be much bigger - depending on who you ask nearly as big as the gigantic Gothic 3. It will be split in several islands, between which you'll travel on your own pirate ship. Yes, Risen 2 is now officially a pirate RPG! Combat mechanics will see progress too: magic spells and ranged weapons are out, voodoo, muskets and dirty tricks are in. You can, for example, throw a parrot at an opponent or use voodoo magic to make one enemy attack another. Other novelties: the first island will be relatively small, to make things easier for new players - after that the game opens up more and more. Storytelling will be more cinematic, companions will used more often. Piranha Bytes blows a fresh breeze into the open world RPG genre. If the marriage between Gothic style gameplay and pirate-ey innovations works, we are optimistic Risen 2 - Dark Waters will become one the RPG highlights of 2012. Publisher Deep Silver will release Risen 2 in late April on PC, XBox 360 and Playstation 3. While the RPG elements in Mass Effect 2 were pared to the bare minimum, the streamlining fits well with the action gameplay - with the exception of a few design missteps. The overarching story in Mass Effect 2 struggled to find momentum but despite some structural repetitiveness, the loyalty missions offered surprising gravitas and strong - if binary - choices. The lore is a hodge-podge cribbed from the length and breadth of scifi but it manages to be interesting and provides the opportunity to add depth to the gameplay. Mass Effect 3 promises to be darker and a separate but intertwined multiplayer element has been added. As the finale of the trilogy, if BioWare utilises the lore, makes the missions more dynamic, finds a way to make the loot/inventory system work and returns some RPG depth, Mass Effect 3 could be a treat for shooter-RPG fans. Our poll was conducted before the demo for Reckoning was released - it would be interesting to see if the results would still be the same. Kingdoms of Amalur: Reckoning combines the talents of Big Huge Games with designers like Ken Rolston and Ian 'Tiberius' Fraser with lore and art from Curt Schilling's "dream team" of R.A. Salvatore and Todd McFarlane. The core of Reckoning is a more direct combat model - something akin to God of War - matched with a semi-open gameworld, five or six factions and a claimed 200 quests. It's an interesting idea - can "arcade" combat successfully team up with a deep semi open-world RPG? As the first big RPG of the year to drop, we don't have long before we'll find out. Like the editors, our visitors also think Risen 2 is the most interesting game to look forward to in 2012. We can't blame them. Again we join hands with our readers in choosing Mass Effect 3 as the runner up. Many are waiting in anticipation for the release of Diablo 3. Will it be as good as its predecessor, better or will it be too streamlined and consolized for the current crowd?Quite a few things have changed in Diablo 3 to make it better according to Blizzard, but there are also those who think it will be a lesser game because of it. We will not know for sure until it is finally released and despite the debate in many fora we all hope it will be a great game to play, which is why it is the top 3 of most anticipated games by our visitors. 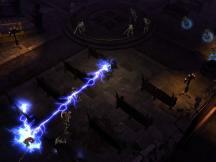 One thing we can be sure of about Diablo 3 is that it is likely to sell millions.